I have two more Dance Legend polishes to share tonight. 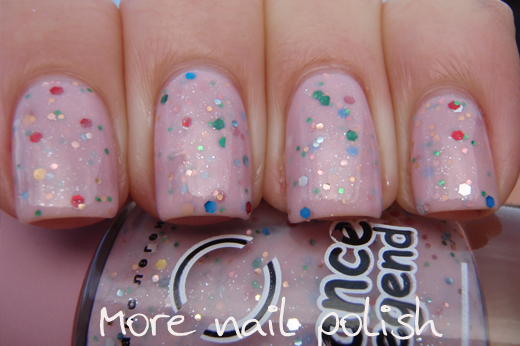 These ones are from the Fruity Milk collection which cosists of pastel milky polishes with coordinated glitters. 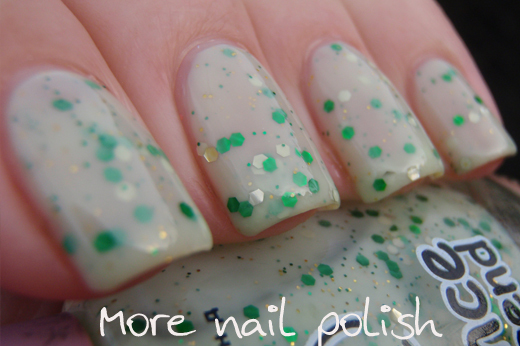 There are six polishes in the collection. 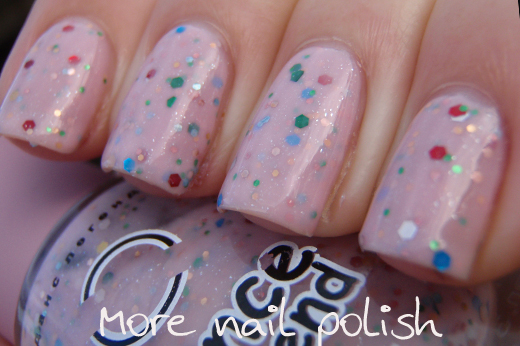 Pink Marshmallow - a pastel pink milky base with a variety of glitters. There are larger red, green, blue, gold and silver hex glitters as well as gold, silver, green and pastels blue smaller glitter and a fine silver shimmer. Again the formula was good and easy to apply. Opacity was a little bitter with this polish, but I still did three coats. All the glitters lay smooth and don't curl and there is a nice mix of glitters without it being a heavy glitter polish.